We have 2 en-suite double bedrooms to offer. One is on the ground floor and the other is on the first floor. There is free WiFi available. We regret neither room is suitable for children. This room has a large double bed with crisp cotton bedding. There is an en-suite shower room with WC and basin. 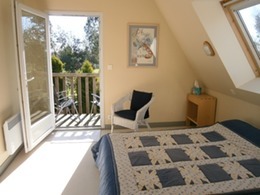 The room is easily accessible, has views over the rear gardens and direct access to a courtyard garden with seating. From the courtyard you can stroll directly into the rear gardens. 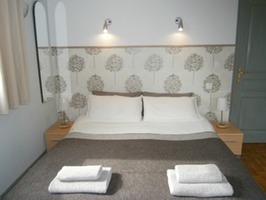 A very bright bedroom with a double bed with crisp cotton bedding.There is an en-suite shower room with WC and basin. A door leads to a small balcony, with patio chairs overlooking the rear gardens. The velux window in the shower room overlooks the front gardens while the bedroom velux looks out over the rear gardens.